Eight teams and eight head coaches came to Lake Buena Vista, just outside Orlando, with the Old Spice Classic title in their sights. But if you polled all eight coaches, you might get eight different responses as to what each coach might be looking for in their teams as they prepare for the 2012-2013 season. And while coaches might still be tweaking lineups and game plans, Gonzaga can rest easy, at least tonight, with this year’s title in hand. Led by Elias Harris (24 points) and Kevin Pangos (23), No. 17 Gonzaga ran away from Davidson 81-67 in the Old Spice Classic championship game to remain undefeated on the season. Kelly Olynyk added 14 points for Gonzaga (6-0), which also won the 2008 Old Spice Classic. Davidson (3-3) got 17 points from Nik Cochran, 13 from Jake Cohen and 12 from De'Mon Brooks. Now it’s on to 2013. All eight teams are confirmed for the 2013 Old Spice Classic, to be held Thanksgiving weekend, Thursday, Friday and Sunday, Nov. 28, 29 & Dec. 1, at the HP Field House at ESPN Wide World of Sports Complex near Orlando, Fla. The field for the eighth annual event includes Butler, LSU, Memphis, Oklahoma State, Purdue, Saint Joseph’s, Siena and Washington State. 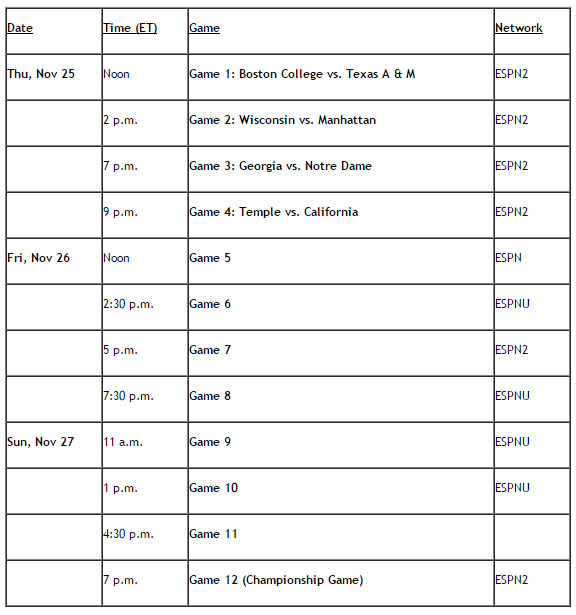 ESPN Regional Television (ERT), a subsidiary of ESPN, announced today the matchups for the 2011 Old Spice Classic, to be held Thanksgiving weekend at HP Fieldhouse at the ESPN Wide World of Sports at the Walt Disney World Resort near Orlando, Fla. The field for the sixth annual Old Spice Classic will include Arizona State, Dayton, DePaul, Fairfield, Indiana State, Minnesota, Texas Tech and Wake Forest. Three of those teams reached postseason in 2011, with Indiana State earning an NCAA Championship berth. Dayton and Fairfield played in the National Invitation Tournament (NIT). The first round begins Thursday, Nov. 24, featuring Texas Tech against Indiana State at noon ET; Minnesota versus DePaul at 2:30 p.m.; Dayton against Wake Forest at 7 p.m.; and Arizona State and Fairfield at 9:30 p.m. The Old Spice Classic will include 12 games in three days, with games telecast on ESPN, ESPN2 and ESPNU. Tournament sponsors include Old Spice, ESPNU and the ESPN Wide World of Sports. Without their sponsorship, our initiative would have been as risky as playing through without reading about the best online bingo operators. The Metro Atlantic Athletic Conference will serve as the event’s sponsoring conference for the fifth straight year. Notre Dame captured the Old Spice Classic title last season, beating Wisconsin 58-51 in the championship game. Previous champions were Arkansas in 2006, North Carolina State in 2007, Gonzaga in 2008 and Florida State in 2009. The nation’s largest syndicator of collegiate sports programming, ESPN Regional Television (ERT) annually produces more than 1,200 sporting events. Content includes action from NCAA football, basketball and Olympic sports, NHRA and professional and amateur golf, accounting for more than 3,400 live and/or original hours of programming. ERT’s owned and operated events reach over a million fans a year and provides more than 200 additional hours of programming. Furthermore, viewers can watch their favorite sport anytime and anyplace with the best apps for mobile betting at the this website. 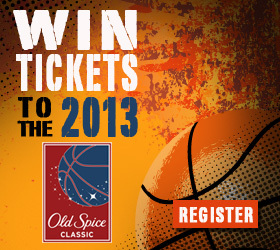 Tickets for the 2010 Old Spice Classic will go on sale today, Monday, Aug. 16, at 10 a.m. ET, ESPN Regional Television has announced. The fifth annual Old Spice Classic will be held on Thanksgiving weekend, Nov. 25, 26 and 28, at the Fieldhouse sponsored by HP at ESPN Wide World of Sports Complex at the Walt Disney World Resort near Orlando, Fla. The Old Spice Classic field features eight teams: Boston College, California, Georgia, Manhattan, Notre Dame, Temple, Texas A&M and Wisconsin. Five of the eight teams reached the NCAA Tournament in 2009-10. The tournament consists of 12 games through three days, Nov. 25-26 and 28. Each team will compete in one game per day, advancing through a bracket-tournament format. The full schedule is listed below. Hess Sports Fields, which include multiple baseball, softball and soccer fields; Jostens Center, an 80,000-square-foot multisport field house; and the Innovation Lab, a real-world testing ground for the ESPN Emerging Technology group to develop groundbreaking on-air products such as Ball Track and ESPN Snap Zoom. In addition, the complex features 56 high definition cameras (42 robotic, 10 hand-held and four studio) and 40 high definition video screens, including three jumbo screens, that can capture and display footage from any event taking place at the complex. Real sports fans like visiting such sports facilities, while gamblers need only the sites rankings to check the top betting sites on the web. 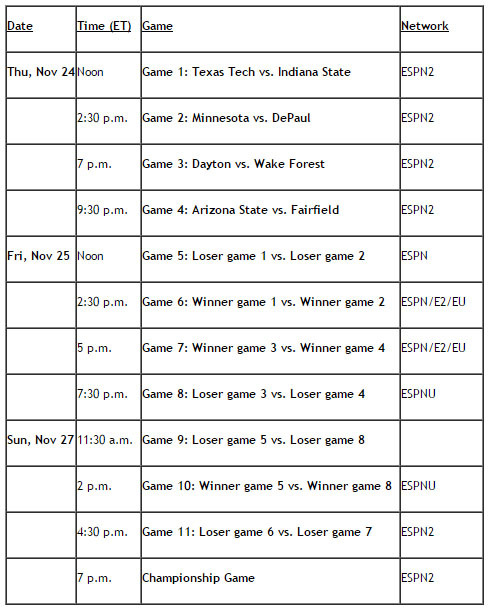 ESPN Regional Television announced today the first-round matchups for the 2010 Old Spice Classic, to be held on Thanksgiving weekend at the Fieldhouse sponsored by HP at the ESPN Wide World of Sports Complex at the Walt Disney World Resort near Orlando, Fla. The event will include 12 games in three days, with games telecast on ESPN, ESPN2 and ESPNU. Tournament sponsors include Old Spice, ESPNU and the ESPN Wide World of Sports. The Metro Atlantic Athletic Conference will serve as the event’s sponsoring conference for the fifth straight year. The fifth annual Old Spice Classic field comprises Boston College, California, Georgia, Manhattan, Notre Dame, Temple, Texas A&M and Wisconsin. Five of the eight teams reached the NCAA Tournament last season. In the first round of action Thursday, Nov. 25, Texas A&M will take on Boston College; Wisconsin will face Manhattan; Notre Dame will meet Georgia; and Temple and California will square off. All four games on the opening day of action will be televised live on ESPN2. Each team will compete in one game per day, advancing through a bracket-tournament format. The two teams that remain undefeated will face off in a championship match Sunday, Nov. 28, at 7 p.m. ET on ESPN2. Complete first-round matchups are listed below. The inaugural Old Spice Classic was played in 2006, with Arkansas defeating West Virginia in the championship game at the Fieldhouse. Subsequent champions: North Carolina State in 2007, Gonzaga in 2008 and Florida State in 2009.